Holy Moly is just one of six wild ales found at Lenny Boy's taproom. Open every Saturday & Sunday, 12 p.m.-6 p.m. 2224 Hawkins St. www.discoverlennyboy.com. Townes Mozer, owner of Lenny Boy Kombucha, is hell bent on firsts. The 26-year-old 'booch expert was the first to open a kombucha brewing business in Charlotte, selling the fermented tea touted by many for its digestive and probiotic benefits, thanks to a special bacterial culture used to make the beverage. Mozer also owns the first certified organic kombucha facility in the Southeast and recently gained licensure to become the first certified organic micro-brewery offering "wild ales," the gluten-free alcoholic counterpart to his line of fizzy non-alcoholic fermented teas. Kombucha beer, if you will. The process of making wild ales begins much like traditional kombucha. An open top fermentation starts the process in a large vat, which is eventually sealed off to send the batch, containing what's known as a SCOBY (symbiotic culture of bacteria and yeast) and flavored with hops, certified organic herbs and produce, into anaerobic respiration for alcoholic magic. The result is an adult beverage, much like a fuller-bodied kombucha, ranging anywhere from 1 percent alcohol by volume (ABV) to 11 percent. John Watkins, the SCOBY caretaker and fellow brewer at Lenny Boy, likens a wild ale intoxication to a "champagne-ish buzz" while Mozer calls it more of a "lucid drunk." The wild ales arriving at a tap near you will contain 2 to 4 percent ABV on average. For perspective, craft beers hang out in the 5.5 percent to 8 percent ABV range. The first Lenny Boy wild ale debuted at Charlotte Oktoberfest, where Mozer introduced Spear-a-melon to the crowd. The blend was a refreshing concoction of organic cantaloupe, mint and Stevia hopped up for a light-bodied, buzz-worthy beverage coming in at 2.5 percent ABV. For Mozer, another Lenny Boy offering in a market saturated with his product is smart business. An alcoholic beverage opens up opportunities that were not happening with his traditional kombucha. "Bars wouldn't put [kombucha] on tap," says Mozer. "But once we started talking alcohol, they were open to it." 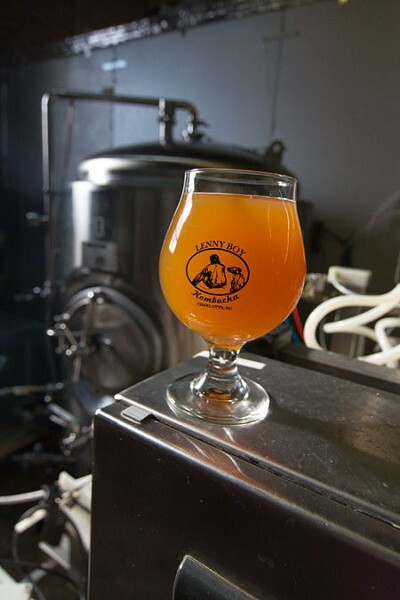 Before wild ale production, Lenny Boy had to partner with local businesses to provide the kegerator system for each distribution spot if it wanted Lenny Boy on tap. The new arm of Lenny Boy beverages has allowed the company to expand, adding new tanks, a bottling system, water filtration system and a newly renovated taproom open on Saturdays and Sundays. Expect to find wild ale blends like Peach Rose, made with organic South Carolina peaches, rose petals, lemongrass, nettles and hops. For the fall junkies, try the Downright Root, a mix of sweet potato, beets, ginger, molasses and hops. The new product also pleases the gluten-free set, many of whom are limited in choice when it comes to getting their drink on, usually sticking with cider or clear liquors like tequila or vodka. Lenny Boy wild ales will be on tap in both Common Markets, Salud Bottle Shop in NoDa, Gallery Twenty-Two in Plaza Midwood and World of Beer in South End. If that doesn't cover enough ground for you, Lenny Boy recently began distributing its traditional kombucha all over the Southeast, from Arkansas to Virginia. With all the new growth, it appears Lenny Boy is turning into one strapping young man. This story has been updated from the original version that ran in print. 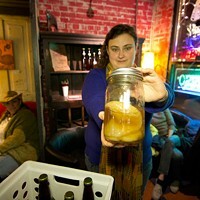 A SCOBY is a symbiotic culture of bacteria and yeast.